In the manufacturing sector, authoring work instructions is no simple task. Consider, for example, the task of making a peanut butter and jelly sandwich. Simple, right? Not necessarily. In a manufacturing context, if you were creating a guide in the form of traditional work instructions, it might be three pages long! Now, consider the obviously more complex task of assembling a car engine, pacemaker or jet turbine. To assemble a single part, an engineer will spend hours writing out – in full detail – each step of the process, ensuring the verbiage used is easily understandable to an operator carrying out the task, in an effort to eliminate confusion. The work instructions may even undergo a graphic design phase – often carried out by an engineer and taking several more hours to complete. Depending on the sophistication of resources available, these illustrations can be crudely made and tough to decipher. Need clarification on how to complete a specific step for a certain part? Simply head over to the library of instruction manuals, comb through dozens of serial-numbered, dust-clad binders until you find the correct part, and leaf through the pages to find instructions for the right step in the process. Good luck reaching your productivity goals! But, what happens if the part number changes, or a component is redesigned? Great question! Writing work instructions is an iterative process. Once created, they must be constantly monitored and updated as changes are made. If an operator is used to doing things a certain way and the process suddenly changes without effective communication of new work instructions, there will be an instant quality defect! Clearly, this traditional method of writing (and utilizing) manufacturing work instructions is outdated and grossly inefficient – both in terms of time and money. It’s time for manufacturing organizations to consider investing in a new and improved method of authoring and executing work instructions – augmented reality. Here are three ways enterprise AR technology is helping to revolutionize the creation of work instructions for manufacturing and assembly processes. AR technology, like Light Guide Systems, allows manufacturing organizations to distill pages upon pages of complex work instructions into a hyper-efficient, visual and easy-to-understand process. Complete with audio and visual prompts, pacing and direction, operators are guided through every step of a manual process. All they have to do is follow the lights! This emphasis on making work instructions visual is especially valuable for international manufacturing companies with multiple facilities in different countries. Work instructions written in the United States can be effortlessly adapted at plants in Mexico Germany or China, ensuring a consistent standardization of assembly processes across global operations. Here at OPS Solutions, we refer to ‘mindwidth’ as bandwidth for your mind – the amount of mental energy required for manufacturing operators to learn and repeat work instructions. Augmented reality tools save valuable mindwidth by visually displaying work instructions directly onto a manufacturing work surface and guiding operators through the process step by step, thus eliminating the need to read through instruction manuals and memorize multiple processes. The adoption of AR technology in this manner results in much faster training periods for new hires, improved product quality, diminished assembly times and higher returns. Our augmented reality solution is so easy to use that all operators need to do is bring their parts to the workstation, scan the barcode and receive their respective work instructions. The graphics displayed with AR technology are incredibly intuitive. If an operator is having trouble assembling a part, for example, they can simply project a step-by-step video onto their worktable. Advanced software even allows operators to make modifications on the fly, for things like noting quality alerts to the rest of the staff. With the help of augmented reality, companies can now use practical augmented reality tools to simplify the process of authoring work instructions, improve employee productivity and power a data-driven culture. If you’re looking to transform your work instruction process with AR, send us a message. A member of our solutions team will be in touch to discuss the challenges you’re facing and talk through various applications that can benefit your operations. 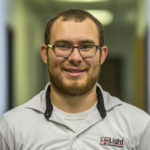 Bradley Foley is an Application Engineer with five years of plastic injection molding design, vision system integration and internal business process and reporting experience. He holds a BSME from Lawrence Technological University. When not at work, you will find Bradley snowboarding in the winter, boating in the summer and practicing martial arts year round.